Here’s Your Snickers. Just Don’t Kill Me. Halloween Has Gotten Milder Over the Years. But—Take It From a Vampirologist—It’s Still About Rule-Breaking and Bargaining. I am a vampirologist. I have a blood-red business card to prove it. And a doctoral dissertation in Slavic folklore. Because of that, people tend to give me things they believe are related to vampires. One friend, a remarkable poet of Lithuanian descent, presented me with a bleached and mounted bat skeleton. I used a photograph of it on the cover of my first book, The Dracula Poems. Around Halloween, people get especially interested in things vampiric and, by extension, horrific. This is when retro cable channels trot out the lineup of old horror movies, at least one of which (Tod Browning’s 1931 Dracula) is the reason why we still see children (and adults) wearing fangs and black opera capes as they go from house to house. Can my field explain the phenomenon? To me, Halloween comes down to two things: bargaining and rule-breaking. Start with the first. 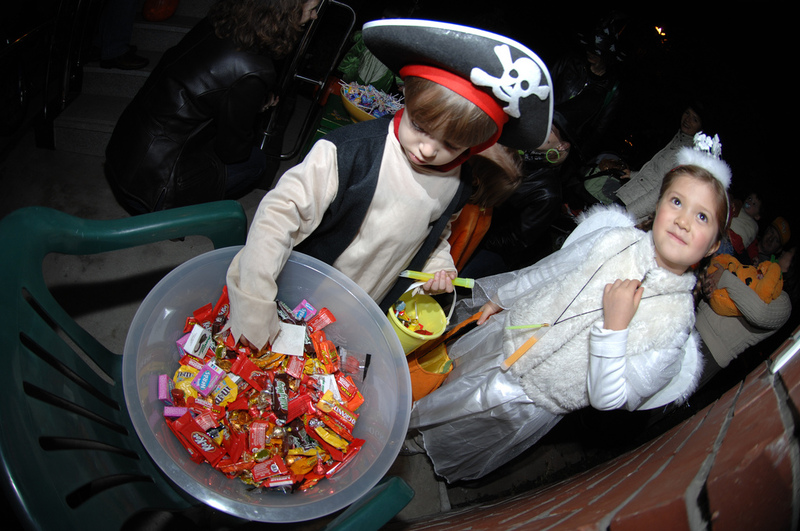 Today, Halloween has devolved into a soft protection racket: Give me the candy, or your house gets egged. (Eggs, by the way, are often used symbolically to suggest fecundity and beginnings, so their intentional waste is a kind of sacrifice, in the way that burning the first fruits of the harvest was an investment in the possibility of guaranteed plenty.) It’s a fairly tame sort of exchange— especially nowadays, when throwing eggs is no longer really part of the equation. But if we look at similar house-hopping, treat-giving rituals in places like Eastern Europe, we can see that this facet of Halloween involves something that used to be rawer and more urgent. In August 1994, in preparation for dissertation research, I traveled with lexicographer Sabina Pavlova to Shiroka Laka, a small Bulgarian village in the Rhodope Mountains, about 30 miles north of the Greek border. During our visit, we were invited into an atelier where animal skins (goat, sheep, bear) were being treated as part of the process of making costumes for an upcoming mountain festival known as Pesponedelnik (“cur Monday”) which occurs in early March and involves villages from all around the Rhodope Mountains. On this day, men (only) from nearby villages gather in the town square wearing these animal costumes and act out symbolic agrarian skits featuring symbolic plowing and sowing. (See my photographs from 2010, or this recent video.) Across Europe, variations of this agrarian ritual are linked obliquely to what we know as Halloween, during which property owners would sacrifice the harvest’s first fruits to demon-like pre-Christian divinities in exchange for plenitude and avoidance of climatic catastrophe. Sometimes, this involved giving baked sweets to children going from door to door with songs of praise or blessing—during Christmas (Bulgarian koleda), for instance. Symbolically, it was an obligatory exchange between the terranean and the subterranean: Those who lived and depended on the earth showed their respect for its generative power (and fear of its power to starve them) by acknowledging what they had been given and offering up some of it. Today in the developed world, where animals and vegetation for consumption are manufactured out of sight and in abundance, Halloween no longer exerts so strong a sense of obligation. It has instead become a kind of theater, a temporal space in which a person is allowed to take on an alternate guise to express a personal dream (ballerina, princess, cowboy) or personal fear (skeleton, pirate, witch, ghost). Sometimes we take elaborate spins into the purely artificial or symbolic (box of cigarettes, condom). But we don’t do it out of a desire to connect with the earth. So if the “bargaining” part of Halloween has been rendered harmless, what about the other aspect of the day, rule-breaking? Like April Fool’s Day, a European ritual that traditionally granted commoners a temporary license to play tricks on the powerful, Halloween is a time when we are allowed briefly to subvert the “natural order,” only to reinforce it by obligingly returning to “normal” the following day. Halloween lets us exhibit an alternate self or give people a fright—sometimes by donning fangs. So if Halloween is about bargaining and rule-breaking, what do these things have to do with one another? Well, judging by the core symbology of Halloween: death. Knowing we do not control hungry natural forces that can wipe us out willy-nilly, we try, desperately, to work out a deal with the fearsome creatures—the vampires, the zombies, the Miley Cyruses (wearing less and less of a costume each year)—that come knocking. The awful animals and the dead and the undead that appear on our doorsteps only one night per solar cycle are in fact demanding not Snickers, but awe. Give them what they want … or else. Bruce McClelland, author of Slayers and Their Vampires: A Cultural History of Killing the Dead, is an expert on Slavic folklore and a poet who lives in Charlottesville, Virginia. Primary Editor: T.A. Frank. Secondary Editor: Kathryn Bowers. *Photo courtesy of U.S. Army Korea (Historical Image Archive).